The article on the front page of The Blaze, the Archdiocesan Gay and Lesbian Outreach (AGLO) Sunday Bulletin went on to describe how the Bemba, an indigenous people living in Zambia, Africa in small groups of 50 to 150 members, deal with someone who has done something wrong. They stop all they are doing, gather together and place the offender in the middle of a circle and one by one they begin to tell the offender everything good they know about him or her. They continue this ritual until everyone in the village has had a turn. Then they celebrate, welcoming him or her back into the community. What a contrast to our present-day society where we seem intent on pursuing every wrong committed by everyone, and making sure the offender is prosecuted and punished to the full extent of the law. I wonder if the Bemba ever heard of Jesus? If they did or didn’t, they sure live the teachings in today’s gospel selection. You know the story. 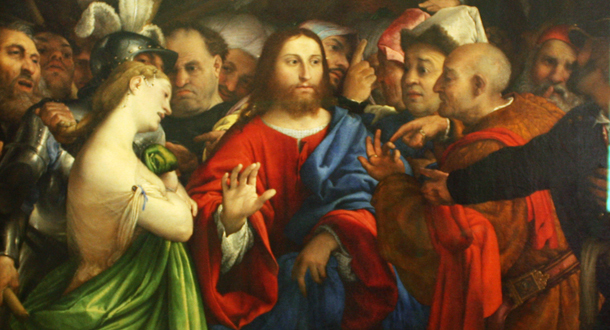 The teachers (Scribes and Pharisees) bring a woman to Jesus and present the problem: “Teacher, this woman was caught in the very act of committing adultery.” (JN 8:4) YIKES! Adultery! Couldn’t John have picked some not so serious sin? Anyway, I’ve read that the Hebrew word for adultery could mean a whole host of sins including idolatry. Now, I can relate to that. Some good advice, don’t you think? I wish I had been that sympathetic with my students when I was teaching. Error: Error validating access token: Session has expired on Monday, 18-Mar-19 14:16:37 PDT. The current time is Thursday, 18-Apr-19 20:01:11 PDT.